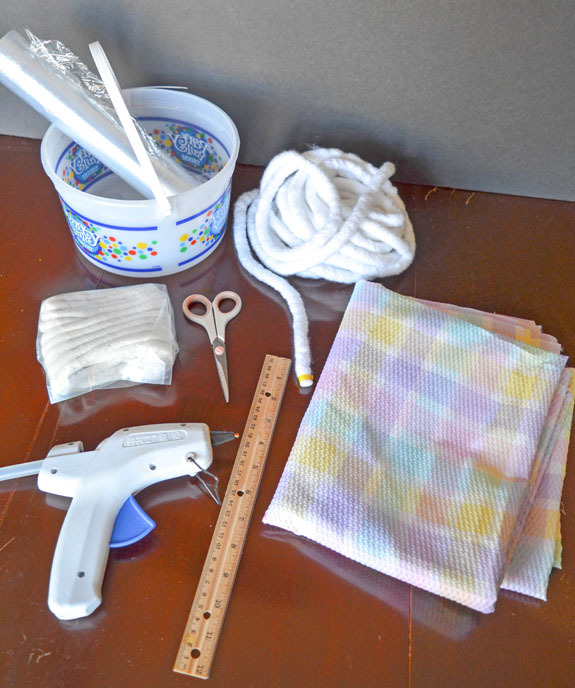 Here is a tutorial for a no-sew fabric Easter basket. Perfect for creating one-of-a-kind baskets for Easter. The year is flying by and it’s already March! Can you believe that Easter is just week’s away? Since we are traveling for spring break, I have started my Easter preparations early. I haven’t come up with a menu yet, but I am preparing my Easter gifts. This year I’ve decided to create a special no-sew fabric Easter basket for a very special family friend, Claire. We’ve known Claire for about 20 years. Our families met at church, and we’ve been friends ever since. Claire has been a super friend to us over the past 3 months. Our family was going through a very trying time and Claire was right there by our side providing support. We didn’t go to her seeking help, she just provided it. That is the type of person Claire is. She’s got a huge heart and always stands up for others. Easter is Claire’s favorite holiday. She opens her home and hosts family and friends each year for an Easter celebration. That get-together includes a huge cascarone egg hunt and smash, food, and fellowship. I’ve decided to make a unique basket for Claire that she can use year after year. I’ve come up with this fabric Easter basket that is created without any sewing skills. The basket looks complicated, but it’s really quite easy. Here are the directions for creating your own basket. Tear the fabric into strips. The width of the tear can be anywhere from about ½-1½ inches. I suggest wider strips for thicker rope and narrower strips for thinner rope. You can approximate your tears or use a ruler. Start each tear by cutting about ½ inch slits along the top of your fabric. I used a plaid seersucker and cut my slits using the design as a guide. The strips do not need to be exact. Heat up your hot glue gun. I recommend that you wear gloves to protect your fingers while gluing to avoid burns. Just take my advice on this one. Start at one end of your rope and glue the end of one strip along that end. Wrap the strip around the rope, overlapping as you go. Glue the end of that strip in place. Overlap the end of the next fabric strip and glue in place. Continue this process until you’ve reached the end of your rope. Wrap the container that you are using as your basket mold with plastic wrap. Use clear tape to hold the plastic wrap in place. Create a flat coil out of your fabric rope by gluing the edges together. Use plenty of glue and hold in place until it hardens. Keep coiling until you’ve formed a nice circle. Place the coil on the bottom of your container and keep coiling in place, spinning the container as you go. You might need to turn the container over once you start going up the sides. Continue to glue and coil until your basket is the size you desire. Cut an angle at the end of the fabric rope and glue in place. Carefully remove the basket from the container. It will probably be stuck to the container in places. The plastic wrap will line the inside of the bowl. Trim the plastic wrap along the top of the basket. It can be removed entirely if desired. I left mine in place. Create a handle for your basket. I took some thinner rope, wrapped it with fabric, then braided it into a handle. I wrapped the ends with extra fabric and then glued them in place on the inside of the basket. Make sure to use a lot of glue to keep the handle attached. Hold the ends in place until all that glue hardens. My daughter and I made a second basket using thinner rope and strips. We used a thicker rope wrapped with a braid of fabrics. Fill your fabric Easter basket and gift to family or friends. Aren’t these so beautiful? I just love how they turned out. In fact, I will be making more. I want a colorful one for myself! I went to Walmart and picked up our favorite Easter candy to fill the baskets. These included M&M’s® Easter Sundae, Starburst® Original Jellybeans, and a 12 oz. DOVE® Milk Chocolate Easter Bunny. The delicious M&M’s® Easter Sundae are only at Walmart and for a limited time, so get some now before they are out! They had such a great selection in the seasonal aisle that I also grabbed a smaller DOVE® Solid Milk Chocolate Bunny, Easter M&M’s® Milk Chocolate, and a huge Easter Mixed Brand Chocolates. Those mini size candies are perfect for baskets or candy bowls. I like putting the M&M’s® and Starburst® Jellybeans in plastic eggs. I also grabbed Hubba Bubba® $1 Bubble Tape, Skittles® $1 eggs, and a Skittles® $1 tube for my teen’s baskets. I’m all set with our Easter baskets. I am glad I picked up so much candy because I will probably be snitching from it. How are you celebrating Easter this year? Find more basket ideas and recipes at the Sweeter Easter Social Hub. Check out my other FUN Easter creations!